You guys, I’m still in denial. Denial that it is mid November and Thanksgiving is just over a week away. Last week, when I shared these insanely fantastic baked apples (which you TOTALLY need to make ASAP by the way), I touched on how I feel about how fast time is going these days. Like, wasn’t it JUST Labor Day?! How is it Thanksgiving already?! Wasn’t my baby JUST born? How is he almost 14 months already?! Ugh. So many feeeeeelings. Sigh. I’m putting aside my feelings, though, and sharing a few of my favorite holiday dishes with you anyway (I started out with dessert. Typical). We’ll call it an out-of-body recipe sharing experience, since my heart just isn’t in it quite yet. Give me another week. Maybe I’ll be there. 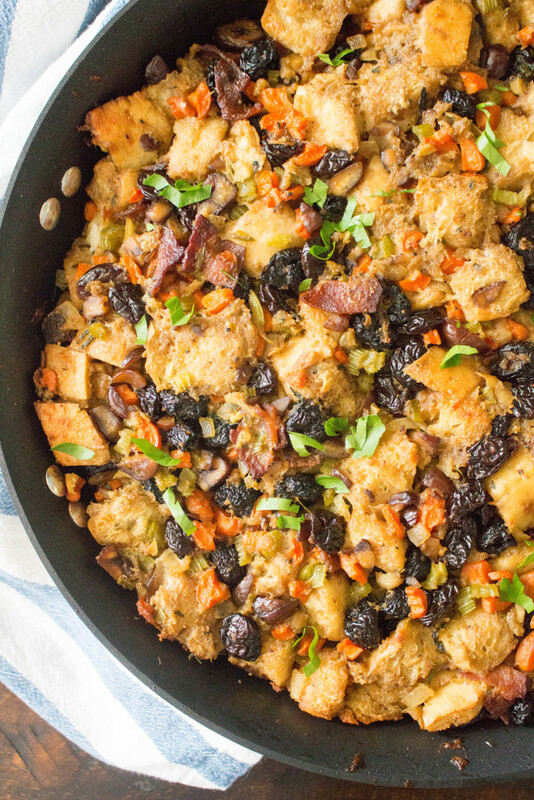 Stuffing is, hands down, my favorite part of Thanksgiving dinner. 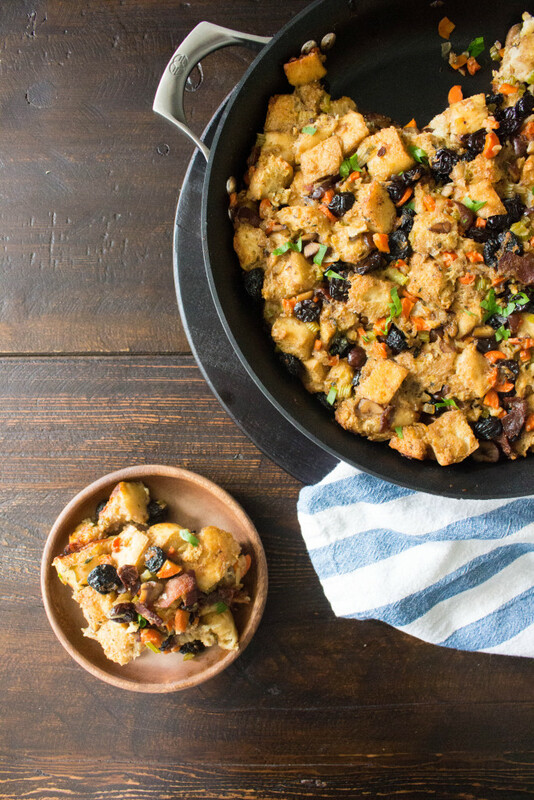 I talked about this last year when I shared this apple cider stuffing. Man, I forgot how good that stuffing was. This year’s rendition may just top it. Now, when it comes to the actual turkey day, my family always eats the stuffing mix that you get from a bag, prepared exactly how instructed on the package. No frills. No creative liberties. 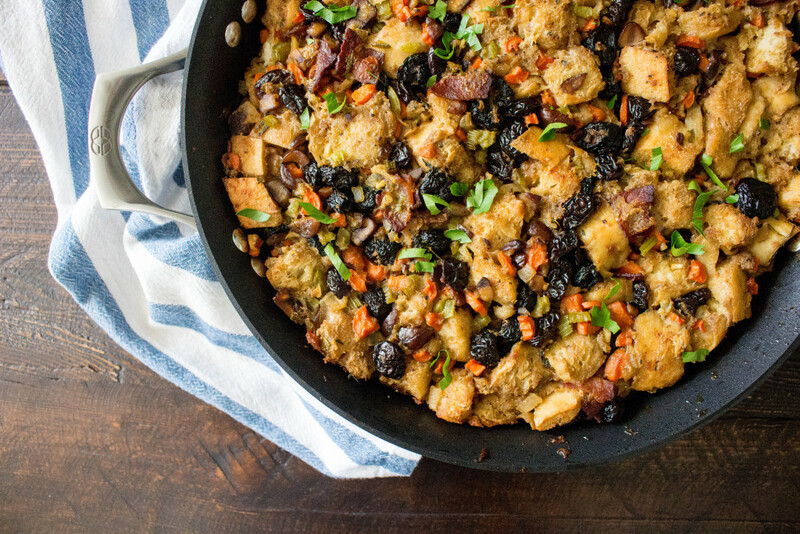 THAT version of stuffing will forever be on my Thanksgiving table, and I’m kind of unapologetic about it. It just tastes like MEMORIES to me. Delicious memories. My sisters and I still fight every year over the stuffing. It is the BEST. Despite this, though, I’ve created yet another stuffing spin for all you normal people out there who are willing to try something out of the box (or bag, in my case). 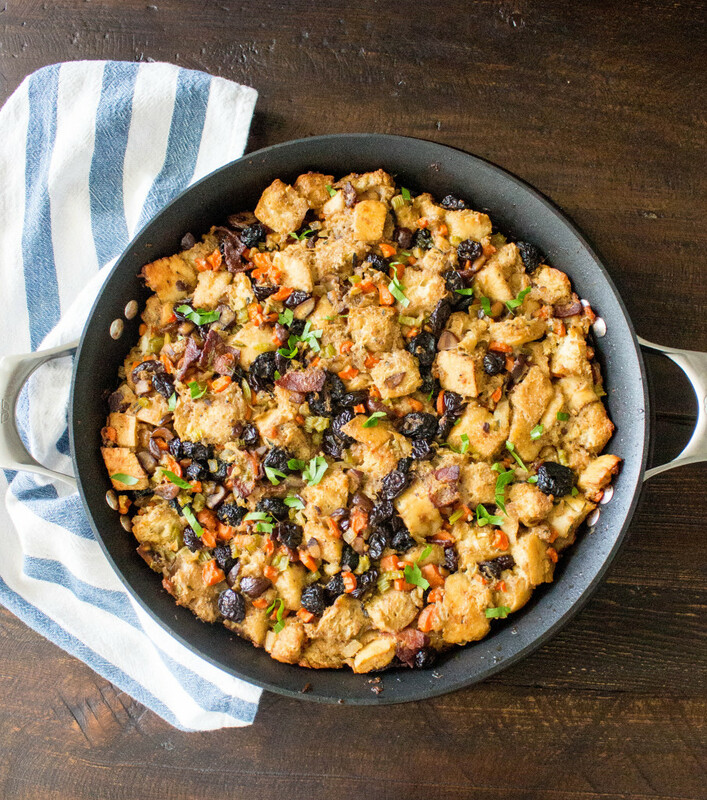 This stuffing (dressing? which term do you use for out-of-the-bird stuffing?) 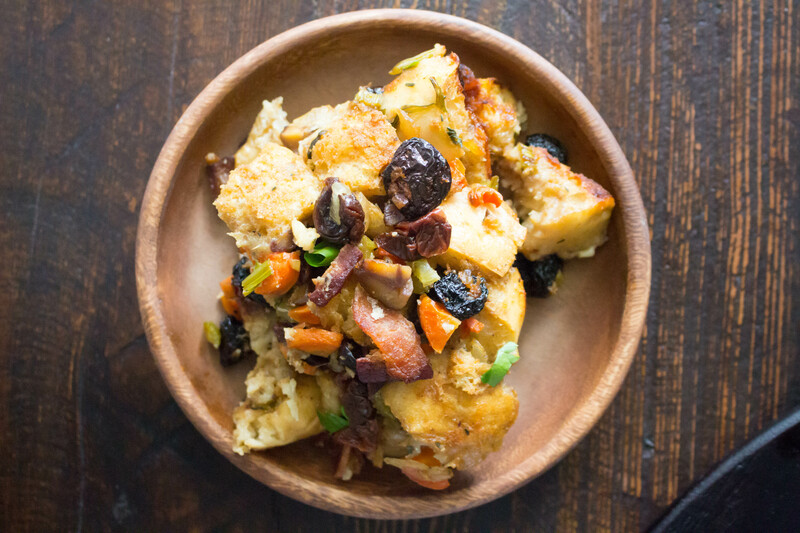 tastes traditional to me in the way of veggies and herbs, but has some fun flavor infusions in the way of roasty-toasty chestnuts and tart-yet-sweet dried cherries. Now, you can prepare and serve this just as I direct below (out of the bird), or you can stuff this into your turkey and serve it that way as well. Either way will work. I am a wimp, though, and almost always cook my stuffing in a pan separate from my turkey. I am not sure why, but stuffing the turkey makes me nervous! I completely irrationally think that I’ll mess it up and somehow give everyone food poisoning. Even though my mom ALWAYS stuffed the turkey when I was growing up. AND it’s no secret that in-the-bird stuffing tastes far superior to pan-baked stuffing. But somehow, I can’t pull the trigger. Maybe I’ll change that this year. I’m hosting 10 people. Seems like an appropriate time to recipe test, no? If you’re like me and don’t want to stuff the bird, just make it in a casserole dish. Follow the recipe exactly. I promise, it still tastes fantastic. Those chestnuts are to die for (and few things scream “holidays!!! !” louder than chestnuts). The fluffy ciabatta is heaven. And the cherries…well, they’re really the star of the show. They plump up and absorb all the flavors going on. And the flavors going on are incredible. 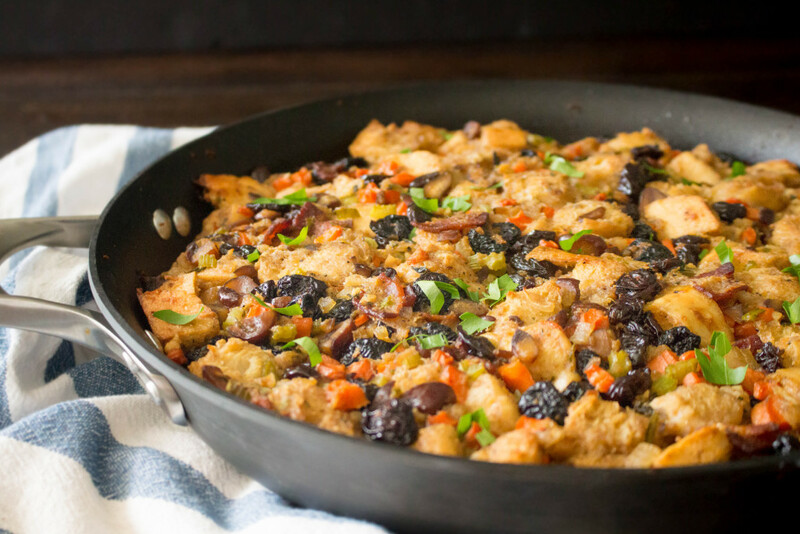 While I can’t stray from our packaged tradition on Thanksgiving day, I definitely can get behind a pan of this stuffing any other day of the year. It’s perfect with turkey, of course, but also makes a fantastic side dish to just about any protein you’re serving. I’m thinking about making some of these genius breakfast sandwiches with the leftovers. OK, I think I’m starting to feel ready for Thanksgiving. Still in denial. But ready to EAT. Preheat oven to 350°F. Butter a large baking or casserole dish (pick one with a lid, if possible). Crisp the bacon in a large skillet. Remove with a slotted spoon and place in a large mixing bowl. To the drippings in the pan, add the butter. Once the butter is melted, add the onions, carrots, celery, garlic, herbs, and brown sugar. Sauté until the vegetables are very tender, about 10 minutes. Gently stir in the chestnuts and dried cherries. Transfer the onion mixture to the large bowl with the bacon. Add the bread, cheese, and 1 cup of the broth. Toss well, adding more broth as needed to moisten the mixture. Taste the stuffing at this point and adjust the salt and pepper, as needed. Whisk the eggs in a small bowl and then add to the stuffing mixture. Toss to combine. Transfer the stuffing to the prepared baking dish. Cover the dish and place in the oven for 30-35 minutes. Uncover and bake for another 10-15 minutes, or until the top is golden. Serve warm. I too am in major denial that Thanksgiving is next week! 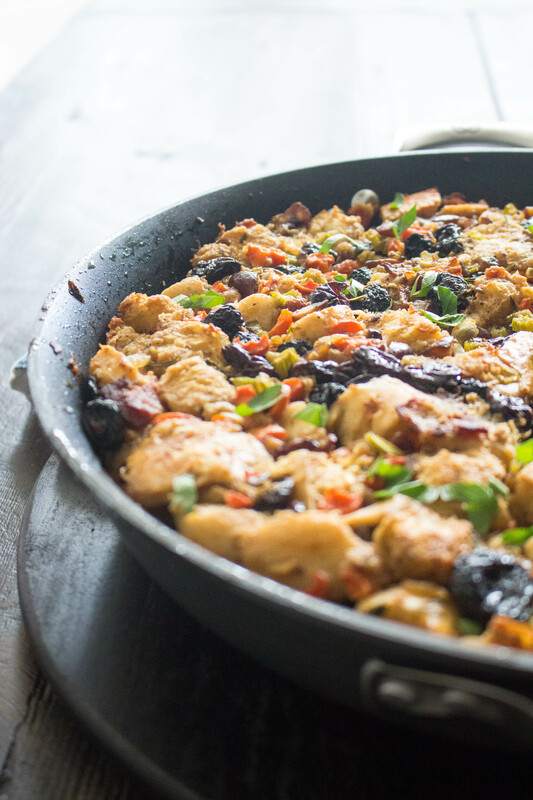 I love the addition of dried cherries in this recipe…and bacon, of course. Who could say no to that? !